Even a healthy, hearty house plant cannot stand up against the “intelligence” of people. So often people cause their own plant problems. But, these problems don’t show for a few days until after the plant has been introduced to their new home. For example, I’m surprised how many times I see a car fly by with leaves hanging out the window flapping in the breeze. It sort of ruins the “hairdo” of a Ficus – 70 miles per hour winds. After it gets home I’m pretty sure that plant will begin dropping leaves in a few days. You purchase the perfect house plant for your home. You put the plant in the trunk of your car or in the car with you. The garden center is only 10 minutes from home. A quick stop to grab some dinner, pick up the dry cleaning or run in to grab a movie for the evening, and your tips is delayed. While handling these errands your plant sits in the car (without air conditioning or heating) and the temperature in the car slowly changes. If the parked car sits in an area where the plant gets just 5 minutes of direct sun through the window – everything may look fine with your new “stress” house plant. A few days later you notice some black spots on the plant and a few leaves are beginning to yellow. Could it be from this brief stress? MAYBE. 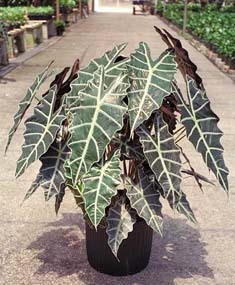 If you purchase a plant and the plant within a few days starts to have some problems with discoloring or black leaves, stop and go back through the route it took to get to your home. You may soon discover the plant was subjected to some extreme conditions on the trip home. In general, house plant enjoy the same temperature conditions you do. Don’t put your plants in any conditions that you would not feel comfortable in. What conditions changed that would have made the plant react the way it has?